Portrait tattoos have held a prized position in the field of tattoo art for a long time now. It is only natural that people would wish to immortalize their idols or pay tribute to their loved ones through tattoo art. 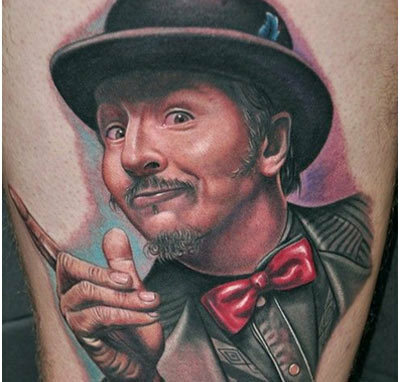 These top ten portrait tattoo designs are sure to leave you thoroughly inspired. Check them out. 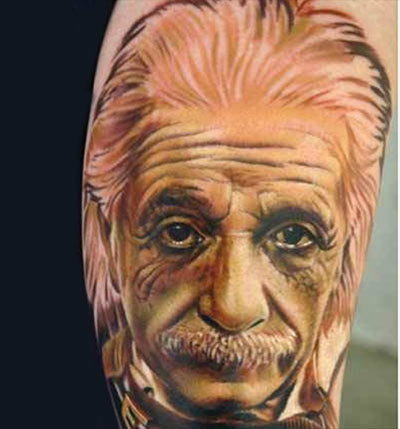 If you are inspired by science and facts, or just idolize this genius, this tattoo should very well have your adrenaline flowing. This is sure to inspire you in your pursuit of knowledge and wisdom. Not easily replicated, its best to seek out the expertise of a seasoned tattoo expert to get this inscribed on your skin. Babies are adorable but they grow up someday. One can’t help but feel a bit of nostalgia for the times your kids were actually kids. 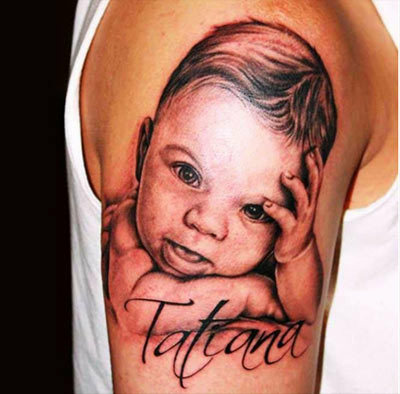 This baby portrait is a great idea if you want the adorable face of your infant child inscribed on you forever. 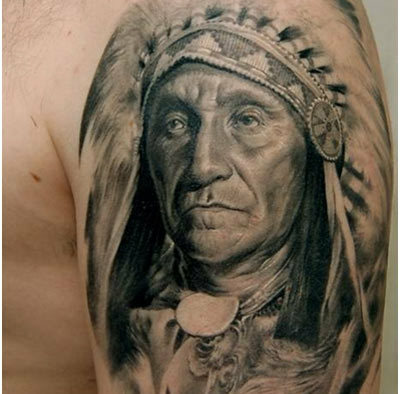 This realistic Native American portrait tattoo has a definite old world charm. 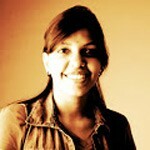 Make a note of the fine artistry that translates into an image having an almost photographic quality. It’s hard not to notice the fine shading details used to create the wrinkles and facial contours. 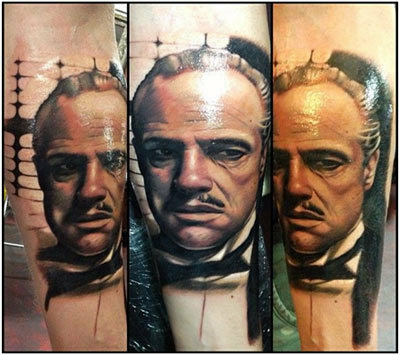 This tattoo featuring Marlon Brando has the potential to be a sure hit with the millions of diehard “Godfather” fans across the world. This is clearly a work of art well-suited for those with an undying love for the movie or this brilliant actor. This could even be an apt tattoo for those with an affinity for retro art. 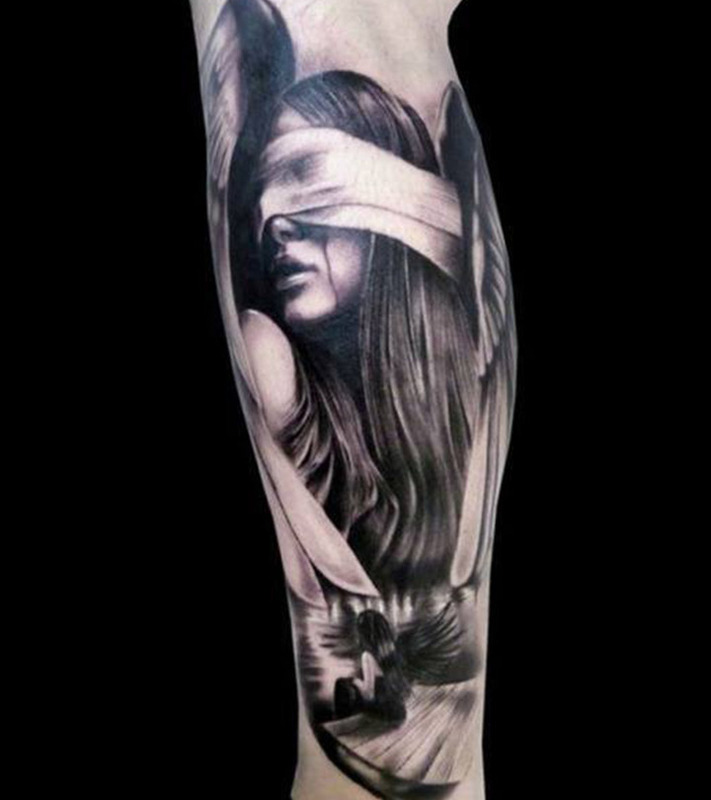 This tragic portrait tattoo, depicting a blindfolded angel crying tears of blood, could be interpreted by different people in different ways. Make a note of the fine shading used to create an aura of darkness and tragedy that accentuates this poetic piece of tattoo art. 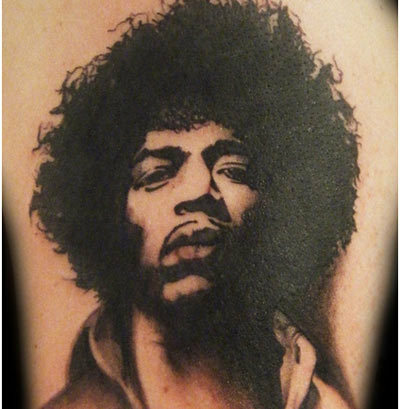 If you love your guitar or simply idolize Jimi Hendrix, (one of the gods of Rock and Roll) then this tattoo is the perfect one for you. 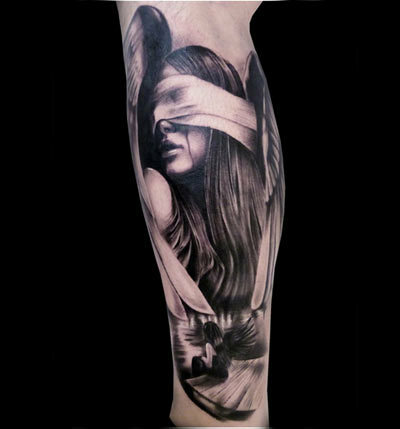 Make a note of the single shade of black that gives this tattoo a quality that is as real as a black and white photograph. This tattoo is also a great piece of art for those with an affinity for retro music and art. It’s no secret that you would be compelled to employ the services of an experienced tattoo artist to replicate this piece of art. This portrait tattoo is the perfect example of how color can be used to accentuate a portrait tattoo. Make a note of the bright red bow tie which contrasts with the color used for the depiction of the facial and body skin. Here’s another portrait tattoo with a definite old world charm. Marilyn Monroe has for long been an inspiration to tattoo artists across the world. With a face that has a definite old world charm, Monroe has been the subject of many acclaimed tattoos for decades. 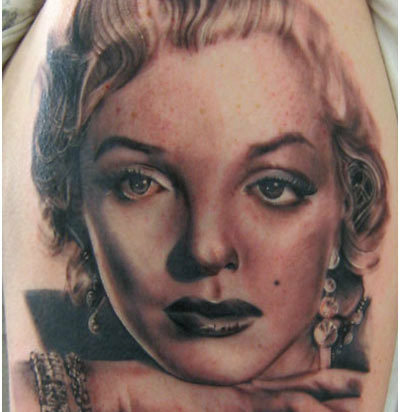 This Marilyn Monroe tattoo has a compelling tragic aura that is hard to ignore. Look closely to see how one eye is red and swollen which is an apparent indication of pain and tears. “Mia Wallace” is the strong female lead played by Uma Thurman in the Quentin Tarantino movie “Pulp Fiction”. 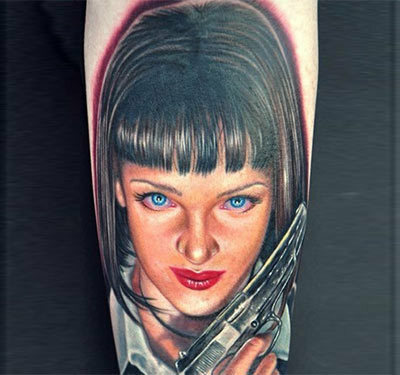 This tattoo portrait of Mia Wallace is bound to be an inspiration for strong women who fight everyday to achieve their goals and ambitions. 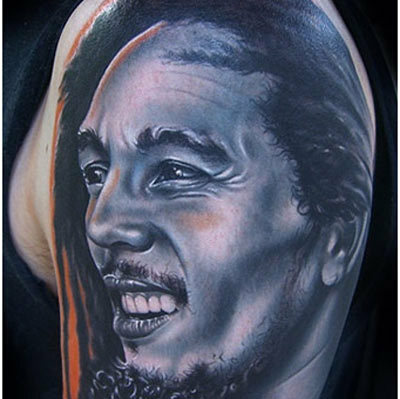 The founder of Reggae and a God for many, Bob Marley is the subject of this brilliant portrait tattoo. If you are a lover of music or a musician yourself, this tattoo is bound to appeal to you. Hope you liked these tattoo portrait designs. Do leave us a comment below. Tattoos last for a lifetime, so get associated to a community and shape your tattoo idea for the best influence.